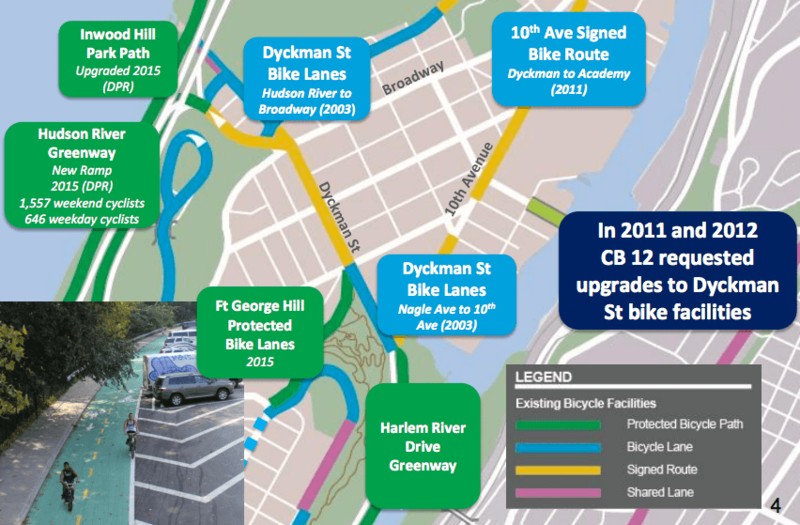 Eight years after uptown advocates first called for a bike connection across Inwood, linking greenways along the Hudson River and the Harlem River, DOT has a bike lane plan for Dyckman Street. Between Broadway and Nagle Avenue, the redesign would convert the current four-lane design into DOT’s standard road diet template — a general traffic lane and a five-foot-wide un-protected bike lane in each direction, plus a painted median and center turn lanes. Between Nagle Avenue and Tenth Avenue, where there are already buffered bike lanes, the project would add a nine-foot two-way protected bike lane with a three-foot buffer along the north side of Harlem River Park. While the plan falls short of the fully-protected connection advocates wanted, it’s a big improvement on a street that currently lacks space for cycling. Washington Heights resident Jonathan Rabinowitz, who has pushed for a bikeable Dyckman Street for several years, said the project will provide a useful link to other recent bike network improvements in the neighborhood. “For someone who is going typically [north-south] like myself, even this minimal on-street bike lane approach is a benefit because it creates a space on those two blocks to connect Fort George Hill with Sherman Avenue,” he said. In addition to the road diet and bike lanes, the project includes new median islands at Vermilyea and Post Avenues and a large painted curb extension and new crosswalk at the intersection with Tenth Avenue. On June 6, DOT presented the Dyckman Street project to the Manhattan Community Board 12 transportation committee [PDF]. Instead of supporting the plan, the committee asked DOT to hold a workshop on the proposal and the overall transportation needs of the area. But neighborhood residents have already waited eight years for safer cycling on Dyckman. The Dyckman project has gone through an interminable public process. In 2008, after months of local advocacy, CB 12 passed a resolution requesting a DOT feasibility study of a Dyckman protected bike lane. Then, in 2011 and again in 2012, the board requested bike lane upgrades. But now that a DOT plan has finally materialized, the committee wants to delay implementation with more meetings. The CB 12 resolution calling for DOT to hold a workshop on the project will get a vote from the full board when it meets on June 28. That meeting starts at 6:30 p.m. at the Campbell Sports Complex’s Richard M. Ruzika Theater, located at 505 West 218th Street. Enough with the Community Boards. Dyckman St needs a protected lane all the way across the dangerous intersection with Broadway. There is quite a bit of cycle traffic (including delivery cyclists) that has to contend with rampant double parking. It took anywhere from 4-8 years after the various CB requests to come up with these bike-stenciled standing zones and we’re supposed to get outraged at the CB for a small delay? The CB is dilly dallying as usual but I think what happened here is called “missing your window”. Thank you, Jonathan, for your hard work and persistence. I would like to note that the Inwood/Sherman Creek traffic study, referenced in this informative Streetsblog article pointed out that the intersection of 10th Avenue, Dyckman Street, and Harlem River Drive was dangerous and needed to be redesigned. It was a fairly obvious conclusion at the time. That report came out more than a year before my son was born; he will enter kindergarten in September. That kind of delay doesn’t reflect very positively on the DOT. Despite overall low automobile ownership per capita, Inwood has far too many. There are far more local automobiles than there is on-street parking. If we can’t get to the idea that turn lanes should take the place of parking and that the other lanes should move over to the curb where turn lanes exist (a configuration found in such car-hating biketopias as Nassau County) we are never going to have good cycling design outside of the CBD. I take it you’re being sarcastic. I’ve seen a bunch of these “you don’t have the standing to comment” replies toward myself and others lately, and I find them pretty galling. Is there something in the content of my comment that you would like to address? Where are those excess local automobiles being stored, if not on street or in garages? Your comment somewhat rebuts Joe R’s favorite policy of reducing on-street parking to reduce automobile density, as your conclusion is that such a policy doesn’t seem to have worked in Inwood. I put Margaret’s name and number there because she can give you the best answer as to why the low-stress bicycling infrastructure you advocate for is not being implemented on Dyckman Street and elsewhere in Manhattan. In the meantime, you are purposefully ignoring the political context of these plans. As someone who David recognizes in the article above as having worked for better bicycle infrastructure on Dyckman Street for several years now, I am well aware of the political context. Your breezy dismissal of the DOT proposal as not meeting the high standards that New Yorkers deserve does not recognize that the plan put forward is a compromise. Ultimately, I admire your consistent support of the low-stress bicycle network concept, but the negative comparisons you draw between the compromise results that Margaret is ready to build and your preferred concept come across as dismissive of the efforts of advocates, including me, and our desire for some actual tangible result we can point to. That’s just it, isn’t it? You (and other advocates) care more about “tangible results” than something that would actually, effectively, promote cycling modeshare. You’re someone who already bikes in the neighborhood; you advocate for a “place for bikes,” and now you have it. But what about the people who don’t bike in the neighborhood, but want to? They’ll try these lanes, find them to be unsafe, and then maybe think twice about it. They’ll tell their friends and co-workers that they tried it once upon a time but found it to be too unsafe. But actually addressing their concerns, actually giving them a reason to get out there and ride and keep riding. that’s just a subsequent step for you. A next step in decades of compromises. In the meantime, cycling modeshare will only creep up as a portion of the “interested but concerned” contingent converts to “road warrior” status in order to deal with this “tangible progress” you claim credit for. And those of us who already are “road warriors” – it’s our bodies that will be left in the streets. The problem with compromises, which I’ve seen time and again, is that there often is never any improvement going forward. Yes, you may have tangible results here instead of nothing (and that’s a good thing BTW), but in the end you may never get anything more. The other side will often say things like “We gave you something. Be happy with it” or “Anytime we give an inch you bicycle advocates want to take a mile”. Even if we assume compromise is sometimes necessary to move forwards, I think it’s still good to mention to the other side repeatedly that what they gave you is a compromise but here’s what really should have been done. For example, in my borough the Queens Boulevard bike lanes seem a reasonable compromise for now given the political climate and budget. Long term, I would personally push for a full-on totally grade-separated bikeway there (or at least overpasses at major intersections). I even feel this may be realistic within a 5 to 10 year time frame. We need to keep the ideal in everyone’s mind even as we might occasionally need to accept compromises. BBnet3000 does a good job at that. I don’t know why we draw a distinction between sharrows, wide parking lanes, and unprotected bike lanes any more. Everyone who uses them knows there’s no functional difference. I get the sense that we’d be celebrating those useless “signed routes,” too, if that was the best we could get. Well, if you put it that way, I would rather have some kind of unsanctioned-by-Phearson bicycle lane in my neighborhood instead of the status quo. Call Margaret and find out what it would take to get a protected lane on Dyckman Street. 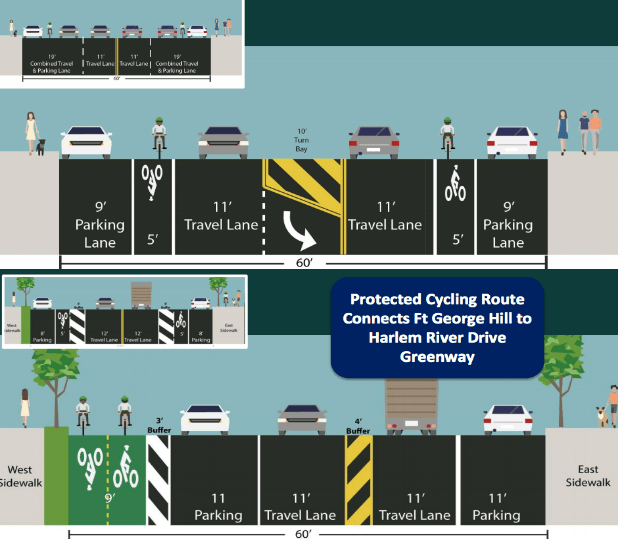 I’ve spent 7 years advocating for the Dyckman Greenway Connector, a true protected lane, and this weak-sauce proposal is what DOT is offering. And now you want me to go to the CB general meeting and complain that it’s not acceptable because it’s not part of a low-stress bike network? Your argument that we should hold firm for the unattainable in bicycle facilities in order to better serve people who are uninterested in bicycling is fairy dust. I agree that bicycle mode share will grow at a creeping pace, short the appearance of a deus ex machina like a ban on overnight parking, or peak oil. You seem ready to blame the delay in the onset of such a remarkable event on the lack of a low-stress bike network. It’s hard for me to see these facilities as unattainable as they are never proposed, at least not publicly. This article itself said the CB requested a study of a protected lane. That study apparently never came, but we did get 10 feet of road width primarily devoted to yellow striping that no one can use. When all this stuff happens behind closed doors the rest of us can’t see the political context. Thanks for filling me in but I’d rather you didn’t have to. You have perceptively identified one of the chief problems with the process: DOT staff or consultants develop the plans, and then DOT staff vet them before presenting them to the CB. There’s no independent analysis. The residents get one proposal from DOT, no alternatives provided. Only in rare cases do they send along more than one design, for the redesign of West 181st St. there were three concepts presented. It’s not part of any network. Yes, you should go back to the CB and tell them this is unacceptable. It’s just… nothing. It’s paint on the street that will be ignored shortly after it’s painted, forgotten when it’s faded, and lost completely when the street is repaved. This is not a “weak-sauce” proposal. This is a “get lost” proposal, and to characterize it as an incremental “win” is to delude yourself. Where are you drawing your observations about painted lanes from? The East 167th St lane between Clay and Morris in the Bronx was milled and paved in October of 2014 and the lane was painted back with the rest of the striping. I will interpret your request for me to denounce the plan at the CB as sarcasm, since being described as a delusional stooge by a soi-disant fellow advocate is pretty demotivating. Thank you Jonathan for fighting for a safer Dyckman Street. Shudder to think what NYC streets would be like if not for you and others willing to sacrifice their time to win these improvements, one imperfect project at a time. There’s a few little lots scattered throughout and plenty illegal locations (e.g. no standing/hydrants/etc). Everyone I know from the area and has access to a private auto admits that the situation is a nightmare. I personally avoid driving into Inwood. It has taken me an hour to get a spot in the past. It’s getting even worse now too (parking/traffic) with increased density and the conversion of the last remaining lots, parking garages, low density structures and gas stations. Even if most new people are not getting cars, any increase strains the neighborhood. Oh boy, the CB meeting tonight just got even crazier. Besides an unusually large number of problematic “restaurant” (read: illegal nightclub) liquor license renewals, and rezoning disaster fallout from 4650 Broadway, now bike lanes are thrown in the mix. A topic which the CB is eminently unqualified to comment, loving their free street parking and hating bikes as befitting a community board that thinks it lives in Staten Island. The one protected bike lane in Inwood, the one on Fort George Hill, they tried to have overturned after it was installed. Hope DOT just ignores them and builds the lanes anyway. Valet parking is no joke – you’re so right. Southern Inwood is awash in club traffic on any given party night and the laws are simply not enforced. Difficult to pull off with the commercial activity there. Perhaps if Dyckman had a BID, there would be someone to reason with, but there isn’t. What is it about this part of the city? I’m just over the Harlem River in Riverdale and ride through here all the time. It’s just an inherently chaotic area, as though the residents are trying to graft a car culture on to an area that can in no way support it. BTW no one walks their bikes on the HH bridge. Broadway is a death trap by the Marble Hill Houses, so the HH is the way to go. In a nutshell, those who have cars love them and need them and protect them. Plus, nightlife businesses expressly cater to customers arriving by car from the Bronx and NJ and northern inner suburbs. The fact that there are two subway lines and a couple nearby Metro North stations are not relevant as those rail connections go northwest and south, not east, west or northeast. The 75% of the residents who do not own cars are outvoted politically by those who do, and DOT has long bent to the wishes of the local pols. It is getting marginally better with Rodriguez, who has a transportation role at City Council and as noted above supports this plan, but as I said above everything is an uphill struggle.